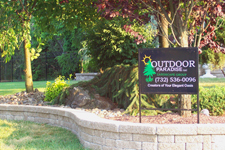 We at Outdoor Paradise keep one thing in mind, the customer. I, as the owner, meet personally with every customer to evaluate the project and start the process to creating their beautiful oasis. With my 15 years experience, I am able to combine your vision with your property evaluation to create a design that is the oasis of your dreams. I will work with you from the first meeting until the last stone is placed. My attention to detail and creative eye has combined to create some of the most elegant landscapes. Our reputation is one that sets us apart from our competitors. We are punctual, truthful, and keep you informed. The crew leaders, myself, and all associated with Outdoor Paradise, will strive to make your landscape experience as pleasant as possible. Outdoor paradise would like to turn your vision into your own elegant outdoor oasis. Let our 15 years of experience make your visions a reality from concept to completion of your own elegant oasis.